All of our Merced movers at Mid Cal Moving & Storage work tirelessly to provide our valued customers with the exceptional services they have come to expect. We have executed thousands of relocations all over the world and have the resources and support necessary to carry out any relocation request. As a BBB-Accredited business and a member of the American Moving and Storage Association, we uphold some of the strictest standards in the industry. We are also a proud agent for Bekins Van Lines, one of the top carriers in the industry. For all of your local, long distance and international moving needs, we are the Merced moving company to call. 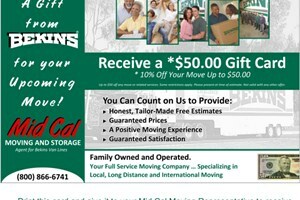 For more information about Mid Cal Moving & Storage and our Merced movers, contact us today. One of our friendly, knowledgeable representatives would be happy to tell you about the comprehensive services we offer. Call us or fill out our Quick Quote form to receive your free, no-obligation moving estimate!